​That quote sums up our commitment to being a value to society. We believe passionately in the preservation of our planet for future generations. It’s why we work so hard every day to minimize the environmental impact of every aspect of our operation. This goes to the very heart of who we are. ​Our Ohio operations are large but our footprint is small. That’s because all of our plants strive for superior energy efficiency and maintain ongoing initiatives to reduce unnecessary consumption and waste. Both our Marysville and East Liberty Auto Plants have earned the coveted Energy Star certification from the U.S. EPA for the ninth consecutive year. This signifies that we rank among the top 25 percent of auto assembly plants in the nation with regards to energy performance. Through this system, we can monitor and control energy usage, identify the best locations to conserve energy use and measure the impact of installing new systems. Going green is something we strive for at all our facilities, not just our production plants. As a matter of fact, we have buildings all across North America that have been recognized as LEED-certified (Leadership in Energy and Environmental Design). They include facilities at our Anna plant, our Troy parts facility and our engineering building in Raymond. ​We continually look to make cleaner, smarter, more energy efficient products available to our customers — products that exceed expectations both for ourselves and our competitors. Our Anna Engine Plant produces our new generation of fuel-efficient engines that greatly reduce the environmental impact of our vehicles. We produce more than 680,000 cars and light trucks every year and we do it with remarkably little waste sent to landfills. For instance, we send leftover steel used in other production applications to our Anna plant to be cast for engine parts. Sand left over from our aluminum and ferrous operations is perfect for local gardens. Even our cafeterias have found ways to reduce waste. We reduced CO2 emissions by up to 25 percent through our Intelligent Paint Booth technology by controlling air temperature and humidity levels in painting operations. Since starting this patented control system at the Marysville Auto Plant in 2008, Honda has implemented the system at its auto plants throughout North America. At our Anna plant, carbon extracted from coke is used to produce iron for casting steel engine and drivetrain parts. Engineers at the plant discovered they could get more carbon from a slightly larger quantity of coke, resulting in the reduction of CO2emissions. The reduced use and shipment of coke at the plant eliminated an estimated 2,700 tons of CO2emissions. We use a variety of equipment and processes that require compressed air, and that compression consumes a lot of energy. To manage it, we have a system in place to ensure we use the right pressure only at the right time. Furthermore, we’ve added ultrasound technologies to identify leaks and speed the repair process. From designing and building a new vehicle to transporting and selling it, “GreenPath” highlights the efforts Honda makes in every stage of a vehicle’s lifecycle to reduce its impact on the environment. 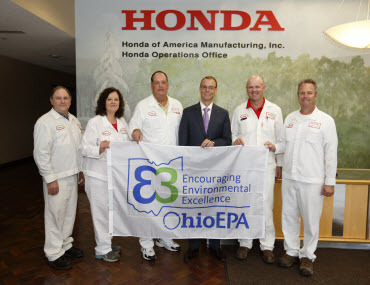 In 2015, the Ohio EPA recognized all three of our plants with the Encouraging Environmental Excellence (E3) Gold-Level Award. The E3 Gold-Level Award is given to a business that holds an excellent environmental compliance record, exceeds regulatory compliance obligations and commits to long-term strategies to reduce waste, lower emissions and improve environmental performance. 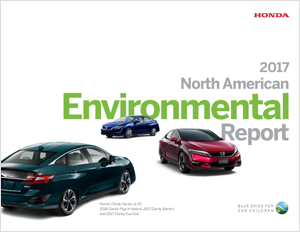 The 2017 North American Environmental Report gives a comprehensive look at Honda products and operations on the continent and our commitment to the environmental well-being of this region and our planet.